Growing up in a royal household in Nigeria, Joni Haastrup began his musical journey performing for his brothers band Sneakers and was quickly snapped up as a vocalist for Orlando Julius Ekemode and his Modern Aces' Super Afro Soul LP, one of Afro-beat's formative LPs. Soon after, Ginger Baker of Cream fame replaced Steve Winwood with Joni on keys for Airforce's UK concerts in '71 and the success of the collaboration led to further shows with Baker as part of the SALT project before he returned to Nigeria to set up MonoMono. 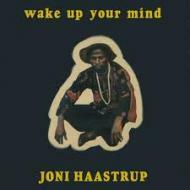 Back in London in 1978, Joni recorded his solo gem Wake Up Your Mind for the Afrodesia imprint. Coming in a Deluxe gatefold Replika LP with printed sleeves.